Jaguar has today announced that all X-TYPE Diesel saloon and estate models will be Euro IV emissions compliant from January 2005 – a year ahead of the date demanded by legislation. The new Euro IV compliant X-TYPE 2.0 Diesel replaces the original model and is available to buy now with prices starting from just £20,995. A price increase of just £500 provides customers with improved driveability and a more responsive engine performance on top of improved tax efficiency. Compliance with the forthcoming 2006 Euro IV emissions regulations brings business and corporate users in the UK, a potential reduction in their annual company car tax bill of around 3%, which comes a year ahead of the ruling. Peak power and torque of the X-TYPE Diesel remain at 130PS and 330Nm, but there are a number of other modifications. A new engine management calibration has been introduced in order to provide a better throttle response and an electronic vane control device has been added to the turbocharger, bringing better driveability due to the improved reaction time of the electronic system versus the previous vacuum system. These changes mean that the engine and vehicle react faster to driver demand for more throttle, giving a feeling of eagerness and increased responsiveness. EU4 emissions have been achieved on X-TYPE without the need for a particulate filter. Jaguar's Corporate Operations Manager, James Drake-Lee, welcomes the changes, "The introduction of this new engine recognises the significance of the Jaguar X-TYPE in the UK fleet sector. The X-TYPE Diesel has always been an extremely competitive proposition in the business market, which has already led to record corporate sales numbers of over 10,000 this year. The EU4 emission compliant X-TYPE will continue to offer everything the executive expects from the premium sector but with personal tax efficiency included in the package." Fuel consumption and CO2 figures have changed slightly as a direct result of achieving the improved emissions status figures, the combined fuel consumption for the Saloon is 49.1mpg and for the Estate 48.5mpg. The CO2 figure for X TYPE diesel saloon increases from 149g/km to 152 g/km, but the estate remains at 154g/km. 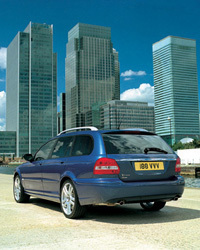 Therefore the estate gains the full benefit of the 3% reduction in company car tax whereas the saloon improves by 2%. These changes mean that a 40% taxpayer will pay £11 less company car tax a month on a saloon classic and £19 less on an estate classic. Both the estate and the diesel also have lower tax payments than their direct competitors. Cost conscious business users looking to transfer to the new X-TYPE Diesel will find price, competitiveness, comfort, driver appeal and comparatively low running costs in every model in the range which runs from £20,995 to £28,395.